If the euphoria of the Test series wasn't already over, then the first 2 ODIs against England will surely mark the end of the euphoria. 260 in the first match was always going to be a competitive score - it was more than Sri Lanka or Pakistan managed in any innings of the last ODI series held in the UAE, but Pakistan's reply was inexcusable. A target of 250 in the second match looked acheivable until a very poor end to the innings meant we eventually fell well short. A brilliant bowling attack can cover for a weaker batting line up in the Test format, but in the limited over formats where you don't have to take 20 wickets to win, batting still wins you matches. This obvious weakness in our batting has been masked by our recent success (12 wins from the last 15 games) found against admittedly weaker opposition. Ask an informed Pakistan cricket fan how long the batting has been a problem and they will intuitively point to the end of the Inzi - Yousuf middle order combination. 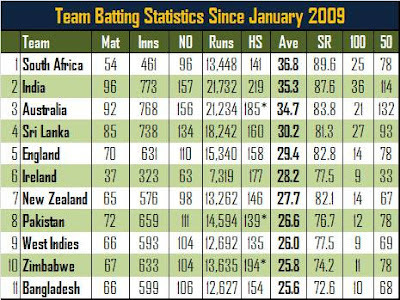 Lets take a look at the top 11 ODI Teams' batting statistics since the beginning of 2009. The numbers tell a startling story, Pakistan's per wicket average of 26.63 ranks them 8th out of 11, above only Zimbabwe, the West Indies and Bangladesh, and below both New Zealand and even Ireland. Their strike rate during the same period of 76.73 ranks them 9th out of 11, above only Zimbabwe and Bangladesh, and below New Zealand, West Indies and Ireland once again. Not only are Pakistan not scoring enough runs, the runs are being scored at a very slow pace. The individual batsmen records paint a similar picture. In terms of runs scored, the first Pakistani is Umar Akmal, at number 31. If you set a minimum qualification of 1000 runs scored and sort the batsmen by average, the first Pakistani is Misbah at 14, follwed by Umar Akmal at 29. 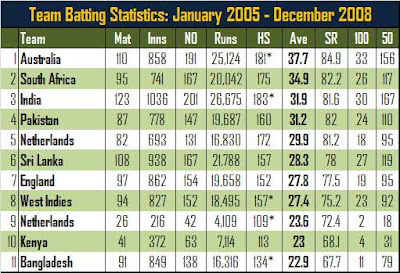 Now lets take a look at the top 11 ODI Teams' batting statistics In the preceding 4-year period (2005 - 2008). Pakistan's per wicket average of 31.19 ranks them 4th out of 11, below Australia and South Africa, and only marginally below India. Their strike rate of 81.99 ranks them 3rd, behind only Australia and South Africa. Individual batsmen records for the same period highlight the Yousuf effect. Mohammad Yousuf is in the top 7 both by runs scored and by average. In terms of runs scored, both Shoaib Malik and Younis Khan are also in the top 20. Pakistan's recent ODI batting struggles are clearly fact and not just a hunch. Only Umar Akmal, Asad Shafiq and to some extent Fawad Alam have been given an extended run in the team. Of the three only Umar Akmal has shown promises of a long term future. Now lets take a look at some other batsmen that have made their ODI debuts for other countries in the last 5 years. Most teams have discovered a good core group of batsmen around whom the ODI team can be built for the next few years. The exceptions being South Africa (but when you have Amla sometimes you don't need any other batsmen) and possibly Australia. With Australia however, it is important to note that they have handed a recent debut to David Warner, and further debuts to 3 promising batsmen (Dan Christian, Peter Forrest and Matthew Wade) in their ongoing ODI tri series. With Bangladesh and Sri Lanka being Pakistan's next two assignments, it is vital that the some of the more senior members of the team take this as an opportunity to retire from limited overs cricket, and that the next generation of batsmen are identified and given an extended run, keeping a firm eye on the next ODI World Cup.